Elegant and refined, Adelaide sits between the rugged south coast of Australia and the foothills of the Mount Lofty Ranges. European immigrants founded this tidy capital of South Australia, and its layout was carefully crafted around the River Torrens, imparting a welcome sense of order balanced by a laid-back vibe. Mining and agriculture brought riches to the city, and today, Adelaide's affluent heritage is still proudly on display. Magnificent private mansions and grand public buildings command an important place amid the modern high-rises. Museums, galleries, gardens, and gourmet restaurants are some of the city's finest treasures, and lovers of the arts can indulge in opera, symphony, and a flourishing live music scene. The city's wide boulevards seem refreshingly uncrowded, and nature is never far away. Parklands ring the city, and a short drive from the CBD, bucolic landscapes and sparkling beaches provide a picturesque playground for outdoorsy locals and lucky tourists. Explore the area with our list of the top tourist attractions in Adelaide. A handsome tree-lined boulevard graced by historic and cultural treasures, North Terrace is a great place to kick off a city tour. Parliament House, at the intersection of King William Street and North Terrace, is perhaps the most imposing building in Adelaide with its monumental colonnade. Just down the street, cheek by cheek, the State Library of South Australia, the South Australian Museum, and the Art Gallery of South Australia offer a triple dose of art and culture and are three of the city's top attractions. Bordering these, the main campus of the University of Adelaide hosts the Mitchell Building, one of the city's finest examples of Gothic Revival style. Other North Terrace treasures include the Migration Museum, Ayer's Historic House, and the Adelaide Botanic Garden, a green thumb's dream. Wander through the wrought-iron gates at the east end of North Terrace and enter a wonderland of botanical treasures. Established in 1855, Adelaide Botanic Garden features educational themed plantings such as medicinal plants, a Mediterranean garden, Australian native species, and a wetland designed to sequester enough water to eventually irrigate the entire grounds. The Santos Museum of Economic Botany provides insight on the important role plants play in everyday life through a series of permanent collections. Other garden favorites include the palm house, the Bicentennial Conservatory with lowland rainforest plants, night-flowering Amazonica water lilies, and Australia's oldest avenue of Moreton Bay fig trees. Exploring these beautiful gardens is one of the best things to do in Adelaide for free. Mount Lofty Botanic Garden is also worth a visit to see its impressive collection of cool climate plants and heritage rose garden. In the heart of Adelaide's cultural precinct, the Art Gallery of South Australia exhibits one of Australia's finest art collections. The elegant, colonnaded Victorian building, established in 1881, sets the tone for the eminent works within its walls. The collection crosses all mediums, from sculpture, paintings, textiles, metalwork, and photographs to ceramics, jewelry, and furniture. The Australian collection spans the colonial days to the present, including indigenous and Torres Strait Islander art. European works highlight pieces from the Renaissance to the present day, and Asian exhibits include Australia's only dedicated Islamic gallery. Important North American pieces are also on display, as well as some evocative avant-garde sculptures. Stadiums aren't always a top attraction in a capital city, but Aussies love their sports, and this venue is an important part of the city's history. Sitting in the center of Adelaide's attractive Riverbank Precinct, the stadium was established in 1871 and hosted its first test cricket match in 1884. Since its founding, the stadium has played host to more than 16 different sports, including AFL, archery, cycling, hockey, lacrosse, and tennis, as well as music concerts and major events. A multi-million-dollar renovation completed in 2014 revitalized the venue, but it still features the old heritage-listed scoreboard and century-old Moreton Bay fig trees. If you have time, try to buy tickets for a sporting match or event here. Cricket fans should make a beeline for the Bradman Museum to see memorabilia on the life of Australia's most famous cricketer. The best way to appreciate this iconic venue is to sign up for an Adelaide Oval Stadium tour. On this 90-minute guided tour, you'll go behind the scenes to see the stadium's top features and learn fascinating stories about its history. Children love the natural history exhibits with stuffed specimens, fossils, and skeletons, and special exhibits mean there's always something new to see. Best of all, this museum is one of the many things to do for free in this culture-rich city. The State Library of South Australia surprises first-time visitors with its dramatic juxtaposition of old and new. The contemporary Spence Wing with its sharp lines and glass-fronted entrance offers modern facilities and free Wi-Fi. From here, ask for directions to the original library, housed in the adjacent 1884 French Renaissance building known as the Mortlock Wing. Entering this grand old space is like stepping back in time. Multi-tiered galleries beckon high above, edged by elaborate wrought iron balustrades, and ladders reach up to leather-bound books neatly propped in the wooden shelves. Highlighting this flashback to libraries of old is a stream of natural light flooding through the glass dome in the roof. The Mortlock Wing is also worth a visit for its special collection of works on the history of South Australia. A few paces west of Victoria Square, on the south side of Grote Street, the Adelaide Central Market is a favorite shopping spot and one of the oldest indoor markets in the world. Founded in 1870, these colorful markets feature fresh fruit and vegetables, flowers, baked goods, cheeses, and a mouth-watering array of multicultural culinary treats. After browsing the produce-packed stalls, enjoy a meal at one of the many cafés in the area or the Asian restaurants in nearby Chinatown, and don't forget to bring your own shopping bags or baskets. Saturday afternoons are prime time for bargain hunters, when some vendors slash prices to move their produce. In the sheltered and surf-free Gulf St. Vincent, the seaside village of Glenelg is a popular escape from the hustle and bustle of the city. To get here, most visitors opt for the 25-minute trip on Adelaide's only surviving tram, which departs from Victoria Square in the city center. As well as its beach appeal and many tourist attractions, Glenelg has a fascinating history. The first group of free settlers disembarked from HMS Buffalo in Holdfast Bay here, making this the oldest European settlement on mainland South Australia. Sidewalk cafés, boutique hotels, and lively summer entertainment create a holiday feel, and tourists will find plenty of family-friendly attractions. Kids can catch their thrills at The Beachouse, an amusement park packed with rides, including a giant waterslide, bumper boats, and Ferris wheel. Those seeking a quieter visit can bask on the beach or cast a fishing line off the pier. Sailing and swimming with dolphins are other popular activities. Less than a 20-minute drive from the city center on the northwestern slopes of Mount Lofty, Cleland Wildlife Park cares for a cute and cuddly bunch of Aussie animals in a naturalistic environment. Kangaroos, wallabies, potoroos, and emus roam freely in the wide-open spaces, and you can wander among them, feed them, and enjoy close-up encounters. Photographers will have a chance to capture some excellent shots, and the interactive keeper presentations provide interesting details about the animals and their habitats. For an extra fee, you can cuddle a koala and take home a souvenir photo. A five-minute walk from North Terrace and Rundle Mall, the Adelaide Festival Centre was Australia's first multi-functional arts venue and excites both locals and tourists with its lively cultural calendar. 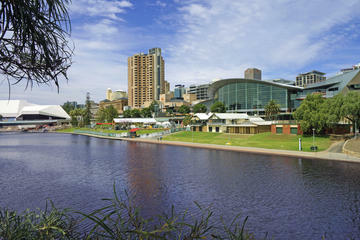 Its white tent-like roof structure is a distinctive landmark along the River Torrens. In addition to the large 2,000-seat Festival Theatre, the venue is home to several smaller theaters, a banquet room, light-filled gallery, and an amphitheater for concerts and recitals. The center hosts the highly regarded Adelaide Arts Festival with theater, opera, ballet, exhibitions, lectures, and readings by writers. Those who don't have time to attend an event can join a behind-the-scenes tour of the dressing rooms and performance spaces. Ample parking and easy accessibility enhance the appeal of this multi-faceted venue. Ayers House is one of the finest examples of Regency architecture in Australia. Originally a modest house built in 1846, it was owned from 1855 to 1878 by Henry Ayers, who for many years was prime minister of South Australia. Ayers transformed it into an elegant 40-room mansion with a large new dining room and a ballroom. It now belongs to the National Trust of South Australia and is a popular event venue, but visitors are welcome to view the house on a guided tour. During the tour, you'll learn fascinating tidbits about the social history of the period, as well as the life and work of Sir Henry Ayers. The interior is famed for its decorative painted finishes on internal walls and ceilings. On display is a superb collection of period decorative arts, furniture, silver, and artwork, as well as changing exhibitions. In the heart of the city, at the intersection with Grote Street and Wakefield Street, King William Street opens out into the revamped Victoria Square, an event venue with beautifully laid out gardens. The square is also known by its aboriginal name, Tarndanyangga. In the shadow of the modern high-rise blocks (among them the Hilton Hotel), a few handsome 19th-century buildings have been preserved. On the south side, stands the imposing Magistrates' Courthouse (1851) with a Doric colonnade, and the Neoclassical Supreme Court (1868). On the east side of Victoria Square lies the Treasury Building adjoining the Town Hall, and St. Francis Xavier Cathedral (1856-1926). Other features of the square include a statue of Queen Victoria and a charming fountain by John Dowie, with figures representing the three principal rivers of South Australia, the Murray, the Torrens, and the Onkaparinga. Victoria Square also hosts the popular Adelaide Central Market, and the city's only surviving tram departs from the square to the seaside suburb of Glenelg. North of Victoria Square, the busy pedestrian-only Rundle Mall runs east from King William Street, lined with large department stores, boutiques, and arcades. Port Adelaide, about 14 kilometers northwest of the city center, is a popular tourist destination with museums, restaurants, and well-preserved heritage buildings. Much of the town is a State Heritage Area. A number of imposing 19th-century buildings such as the 1879 Customs House and the Courthouse bear witness to this city's early prosperity as a thriving port. Top tourist diversions include dolphin-spotting cruises and a clutch of intriguing transport-themed museums including a National Railway Museum; South Australian Aviation Museum; and the South Australian Maritime Museum, where you can browse interesting exhibits on the region's seafaring history. Seafood lovers head to the Fishermen's Wharf Markets on Sundays to buy fresh-caught fish straight from the boats. The Migration Museum, housed in a beautifully restored building behind the State Library, traces three centuries of immigration history in South Australia. From aboriginal history before colonization to the impact of immigration on their culture and local communities, visitors will gain insight into the pioneering spirit and diverse cultures that changed the face of South Australia. Personal stories of some of the immigrants infuse a poignant note to this worthwhile museum, and the interactive displays will keep the kids entertained. Admission is free, except for certain special events and exhibitions. Settled by Prussian and English immigrants, the Barossa Valley is about an hour's drive from Adelaide airport and is one of Australia's oldest grape-growing regions. Foodies will be in heaven here with the plethora of fresh produce and fabulous restaurants. In addition to all the gastronomic delights, you'll find some cultural treasures in the region such as heritage trails, cookery schools, craft stores, galleries, and museums. A little farther afield, the rolling green hills of the Clare Valley also nurture a rich grape-growing history and thriving gourmet food culture. Less than hour's drive south of Adelaide's city center, the Fleurieu Peninsula is one of Adelaide's most popular coastal day trip destinations. Rolling hills, farms, fantastic surf beaches, and upscale dining lure foodies and city slickers looking for a slower pace. Victor Harbour is the largest and one of the most popular towns along this rugged peninsula. From here, you can hop aboard a seasonal whale-watching cruise or fishing charter, surf one of the south coast swells, cast a line from one of the windswept beaches, or take a horse-drawn tram to Granite Island with its dwindling colony of Little Penguins. Goolwa, by the Murray River, is another popular peninsular town as are the inland towns of Strathalbyn and Mount Compass. In the beautiful Adelaide Hills, about 20 minutes from the city center, Hahndorf is Australia's oldest surviving German settlement having been established 1839 by German Protestants from East Prussia. Tree-lined streets, half-timbered houses, and steeple-topped Lutheran churches imbue the town with a European village charm, and the many farms and German restaurants will delight foodies. A great place to start a tour is the former 1857 schoolhouse, which houses the visitor center and the Hahndorf Academy, an art gallery spotlighting local artists. Hahndorf is famed for one of its talented residents, Sir Hans Heysen (1877-1968), a German-born landscape artist who came to Australia in 1883 and later built an Alpine-style house on the outskirts of Hahndorf. Today, you can take a guided tour of his home and studio, known as The Cedars, stroll through the colorful gardens, and view some of his paintings. Sightseers can easily spend a relaxing day in this charming village picking fruit at nearby farms, browsing the craft shops and galleries, and dining at the excellent restaurants. Most of Adelaide's top attractions are centered around North Terrace on the south bank of the River Torrens, and this is where you'll find the best luxury and mid-range hotels. Budget accommodation typically tends to be a little farther out but still within easy reach of the prime sightseeing spots. You'll also find some great affordable options around North Adelaide, near Adelaide Oval and the zoo. Luxury Hotels: Steps from Rundle Mall, in the heart of the city, the boutique Mayfair Hotel occupies a 19th-century heritage building. Rooms are contemporary, with plush beds, rainfall showers, and sleek decor. Guests mingle at the French cafe and rooftop terrace, and the weekend high tea is a treat. On North Terrace, The Playford - MGallery by Sofitel exudes Art Nouveau charm. Chandeliers grace the upscale restaurant, and guests keep fit at the 24-hour health club and heated indoor pool. The pillow menu is a posh perk. Also on North Terrace, the InterContinental Adelaide is less than a minute from Adelaide train station. The rooms come with city or river views and marble bathrooms. Dining options range from Japanese teppanyaki and sushi to an inviting riverside restaurant. Mid-Range Hotels: Convenient for families and longer stays, the Adina Apartment Hotel Adelaide Treasury occupies an elegant historic building near Victoria Square. The studios and apartments come with kitchens, and the excellent facilities include a central courtyard and indoor pool. Within walking distance of city attractions, shops, and restaurants, Majestic Roof Garden Hotel offers spacious rooms and a lovely rooftop garden. Suites add separate living areas and kitchens. At the Adabco Boutique Hotel in a heritage building nearby, guests have access to a communal kitchen and laundry facilities. Budget Hotels: Light flows in through floor-to-ceiling windows at the Ibis Adelaide, and the rooms come with free Wi-Fi. At the artsy and modern Majestic Minima Hotel, the petite rooms are individually decorated, and you can walk to Adelaide Oval and the zoo. A little farther afield, in North Adelaide, Princes Lodge Motel offers peaceful park views, a couple of kilometers from city center attractions. City Tour: If you want to see the top sights in this elegant city, but only have one day, the Adelaide City Tour with Optional River Cruise and Adelaide Zoo Admission is a great option. Sit back, soak up some history, and see all the highlights on this three-hour city coach tour, including the museums and heritage architecture along North Terrace and the city's lush parks. You'll also stop for coffee and sweet treats at the famous Haigh's Chocolates. For a different perspective of the city, you can upgrade your tour to include a cruise along the Torrens River and free admission to Adelaide Zoo. Scenic South Australia: Once you've seen the best of Adelaide, you'll find plenty of other things to see and do in South Australia. Less than an hour from the city, you can explore the bucolic scenery of the Barossa Valley, one of the country's top grape-growing regions and a haven for foodies. 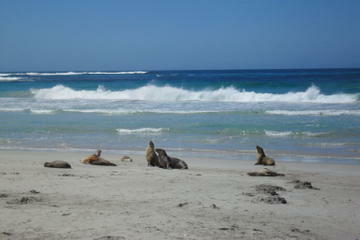 If you're looking for an escape to nature, Kangaroo Island ticks all the boxes, with abundant wildlife, fantastic hiking trails, and one of Australia's best beaches. Other top places to visit in South Australia include the sparkling Fleurieu Peninsula, the pink-hued peaks of the Flinders Ranges, and the wild and windswept Eyre Peninsula. More Aussie Adventures: If you're looking for an adrenalin rush, see our article on the Top-Rated Outdoor Adventures in Australia. For tips on where to cast your line, our article on Australia's best fishing destinations is worth a look, and if you want to explore the country's spectacular scenery on foot, consult our page on the top-rated hikes in Australia. Not sure where to go? Our article on planning your trip to Australia suggests seven great itineraries.